In light of the risk Florence poses to the U.S., we’re publicly releasing our morning briefings on our blog. Check back daily for more updates. We are also providing a small sampling of our tropical weather graphics as we continue to track Hurricane Florence in the Atlantic. 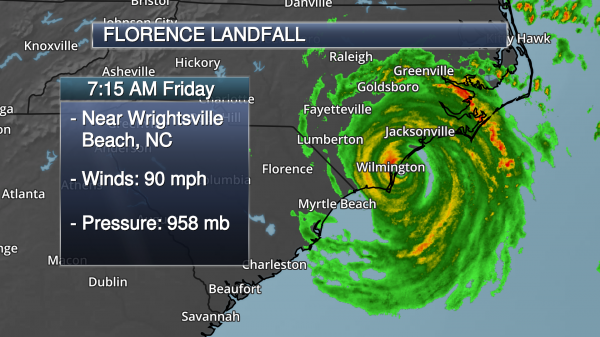 Hurricane Florence made landfall earlier this morning as a Category 1 hurricane near Wrightsville Beach, NC, with winds of 90 mph. 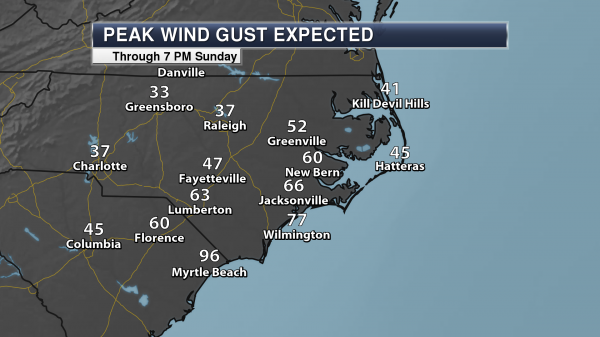 However, wind gusts up to 105 mph have been reported this morning in Wilmington and Fort Macon, NC. This wind has helped knock power out to over a half a million customers across the Carolinas. 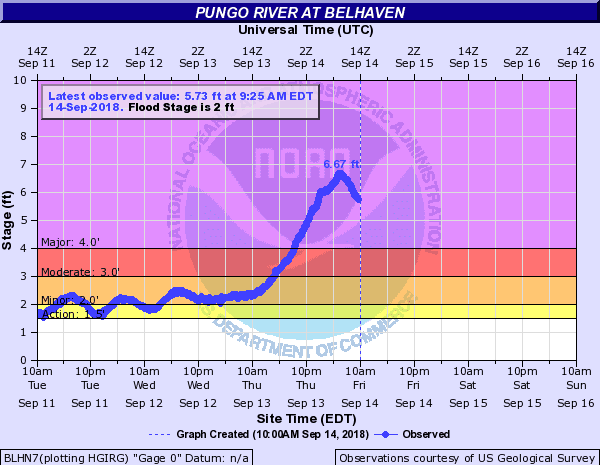 Storm surge and freshwater flooding has also been occurring due to Florence. 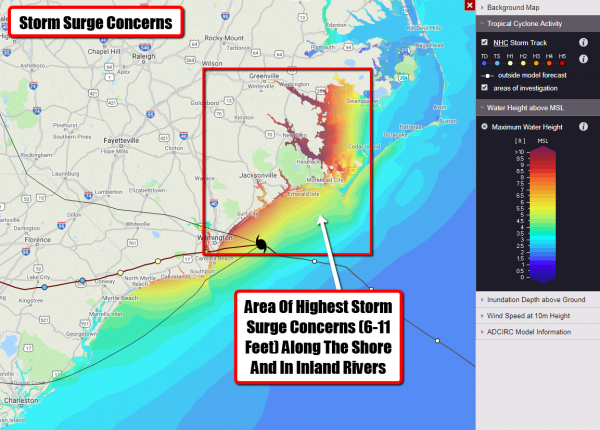 Over 10-12” of rain has fallen across parts of coastal North Carolina, and at least 200 people have had to be rescued overnight in the New Bern, NC, area due to storm surge flooding. 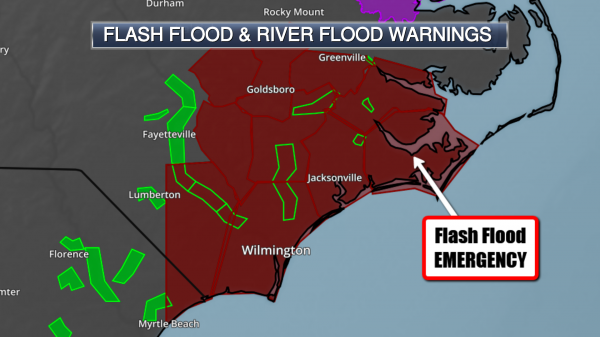 Numerous Flash Flood Warnings are in effect, and a Flash Flood Emergency is in place across parts of Carteret, Craven, Pamlico, and Jones Counties in North Carolina until 1 PM. Even though this storm has made landfall, it will remain a dangerous storm into the weekend across the region. Florence will continue to slowly move west to west-southwest through Saturday, continuing to lash portions of North and South Carolina through the weekend with gusty winds, heavy rain which could lead to catastrophic flooding, and dangerous storm surge along the coast and in some inland rivers near the coast. While an area of disturbed weather in the Gulf of Mexico does not look like it will form into a tropical system before it moves into Texas later today, heavy rain and occasional gusty winds will be possible across southern Texas into Saturday. Flash Flood Watches are in effect. 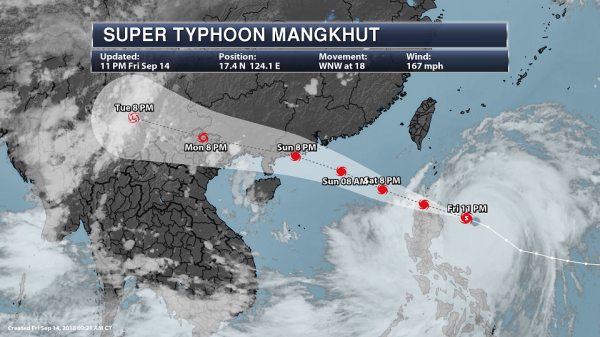 Super Typhoon Mangkhut will have impacts across parts of southeastern Asia into the weekend. 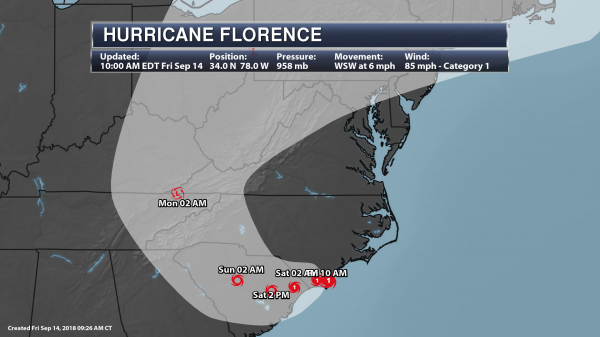 Florence Has Made Landfall. The National Hurricane Center reported that Florence officially made landfall at 7:15 AM this morning near Wrightsville Beach, NC. 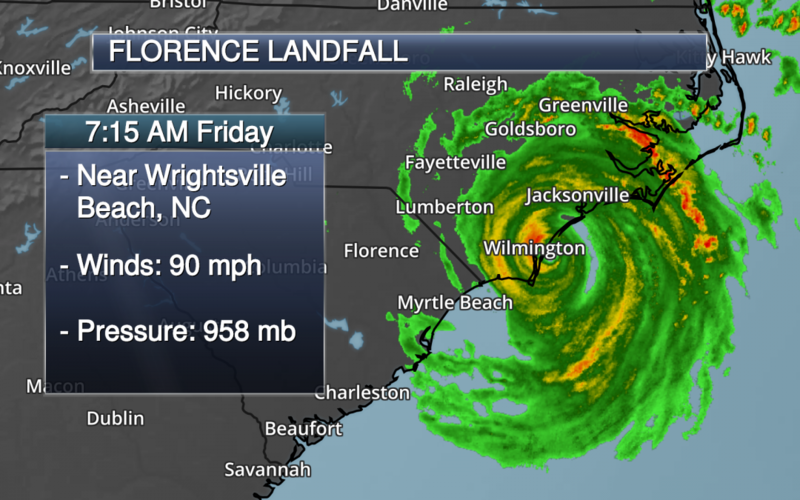 At that time, Florence had estimated sustained winds of 90 mph. 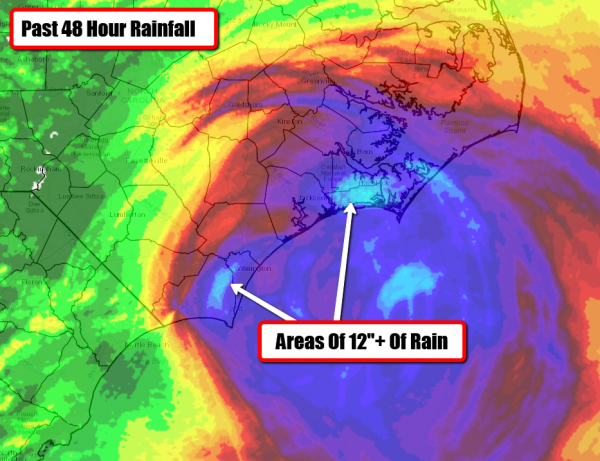 Around the time of landfall, Wilmington, NC, saw a wind gust of 105 mph. 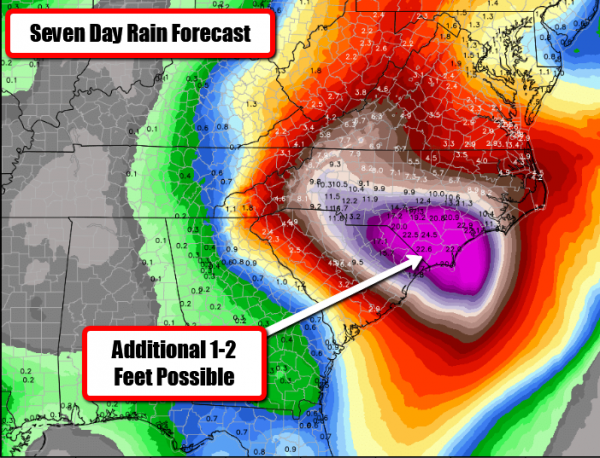 Even though Florence has made landfall, this system remains a strong and dangerous system which will continue to bring major rainfall and life-threatening storm surge across the Carolinas as well as strong, gusty winds. 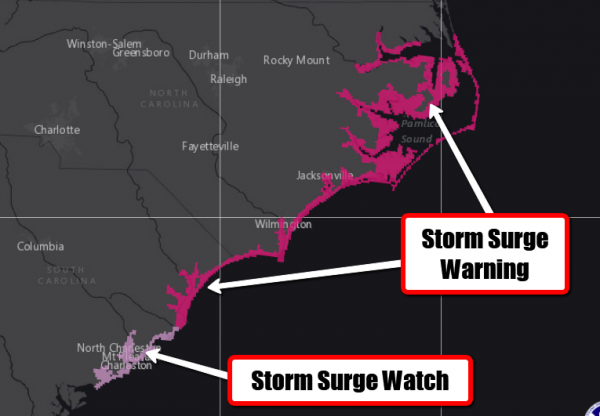 Hurricane Warnings continue for Myrtle Beach (SC), Wilmington, Jacksonville, New Bern and Greenville (NC). 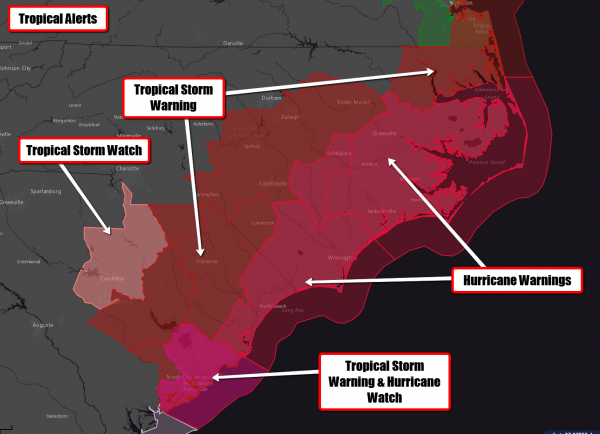 Tropical Storm Warnings continue for Charleston and Florence (SC), Lumberton, Fayetteville, Raleigh and Rocky Mount (NC). Hurricane Watches are in effect for Charleston, SC. 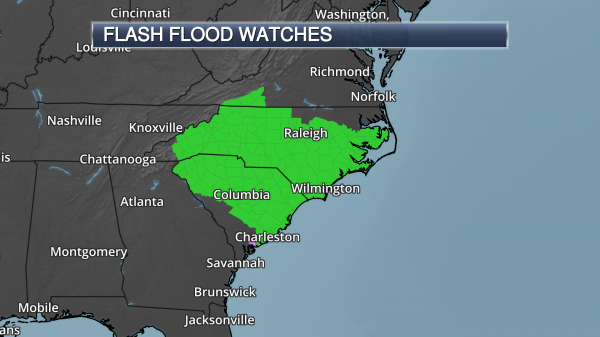 Tropical Storm Watches are in effect for Columbia, SC. Strong Wind Gusts To Continue. Even though Florence will continue to weaken, the threat of damaging wind gusts across the Carolinas will continue over the next couple days as Florence remains a hurricane and tropical storm. 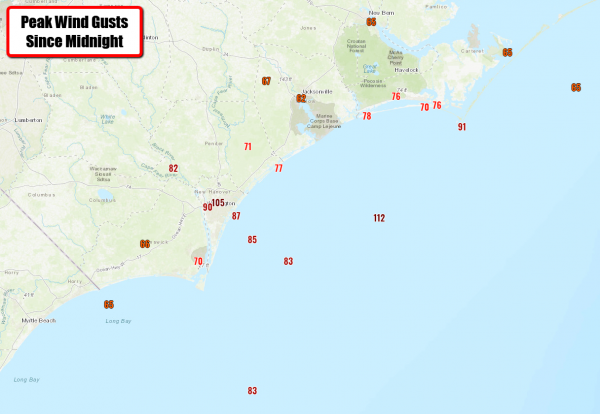 Winds could still gust up to almost 100 mph in parts of southeastern North Carolina and northeastern South Carolina today and tonight. These winds will easily knock out power and down trees across the region. Tornado Watch Until 5 PM ET. Landfalling tropical systems also pose the potential of producing tornadoes. 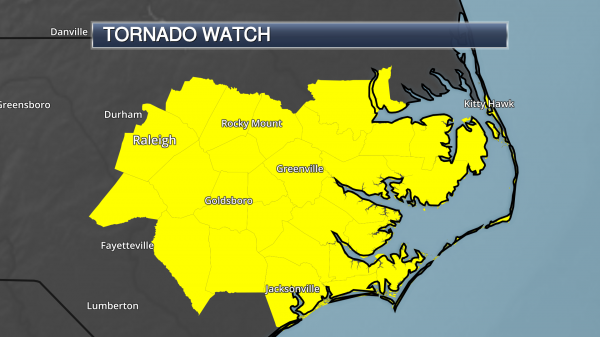 Due to the potential of a few tornadoes today, a Tornado Watch has been issued for parts of eastern North Carolina (including Raleigh, Jacksonville, Greenville, New Bern, and Hatteras) until 5 PM. Heavy Texas Rain. As an area of disturbed weather moves into Texas later today, heavy rain will be possible across southern portions of the state through Saturday. 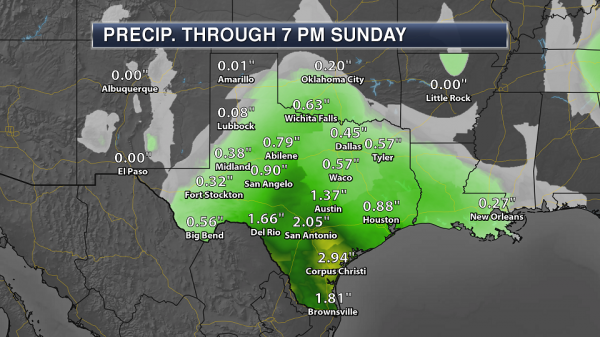 Rainfall totals of 1” to 3” will be possible over the next several days. This area of disturbed weather is what we had been watching across the Gulf Coast for potential tropical development earlier this week. Flash Flood Watches. 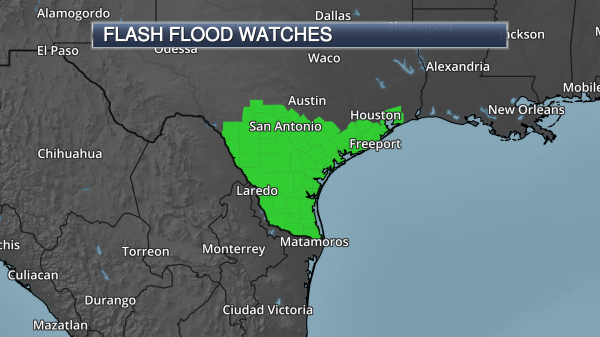 Due to the heavy rain threat across southern Texas, numerous Flash Flood Watches have been issued today into Saturday. Tracking Mangkhut. Out in the western Pacific, we continue to track Super Typhoon Mangkhut. As of the 11 PM local time update, Mangkhut was moving to the west-northwest at 18 mph with 165 mph winds. The system is expected to continue in a west-northwesterly direction over the next several days. This path would bring Mangkhut toward Southeast Asia into the weekend. Right now the system looks to pass south of Tawain, more impacting parts of the northern Philippines over the next 12-24 hours local time before the center passes south and west of Hong Kong Sunday.